Although it is often thought of as a special topic in orderstatistics, records form a unique area, independent of the study ofsample extremes. Interest in records has increased steadily overthe years since Chandler formulated the theory of records in 1952.Numerous applications of them have been developed in such far-flungfields as meteorology, sports analysis, hydrology, and stock marketanalysis, to name just a few. And the literature on the subjectcurrently comprises papers and journal articles numbering in thehundreds. Which is why it is so nice to have this book devotedexclusively to this lively area of statistics. Written by an exceptionally well-qualified author team, Recordspresents a comprehensive treatment of record theory and itsapplications in a variety of disciplines. 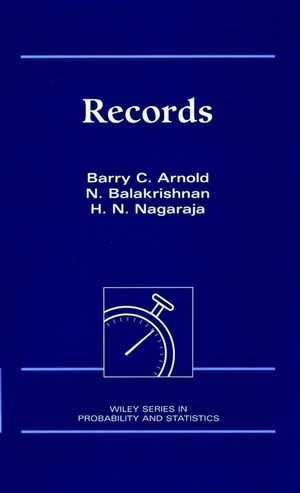 With the help of amultitude of fascinating examples, Professors Arnold, Balakrishnan,and Nagaraja help readers quickly master basic and advanced recordvalue concepts and procedures, from the classical record valuemodel to random and multivariate record models. The book follows arational textbook format, featuring witty and insightful chapterintroductions that help smooth transitions from one topic toanother and challenging chapter-end exercises, which expand on thematerial covered. An extensive bibliography and numerous referencesthroughout the text specify sources for further readings onrelevant topics. Records is a valuable professional resource forprobabilists and statisticians, in addition to appliedstatisticians, meteorologists, hydrologists, market analysts, andsports analysts. It also makes an excellent primary text forcourses in record theory and a supplement to order statisticscourses. BARRY C. ARNOLD is Professor in the Department of Statistics atUniversity of California, Riverside. He is a Fellow of both theAmerican Statistical Association and the Institute of MathematicalStatistics. His publications include another Wiley book, A FirstCourse in Order Statistics. N. BALAKRISHNAN is Professor in the Department of Mathematics andStatistics at McMaster University, Canada. He is a Fellow of theAmerican Statistical Association. His publications include otherWiley books: A First Course in Order Statistics, ContinuousUnivariate Distributions - 1 & 2, and Discrete MultivariateDistributions. H. N. NAGARAJA is Professor in the Department of Statistics at OhioState University, Columbus. His publications include another Wileybook, A First Course in Order Statistics.